Design Thinking is a strategy for innovation that wins ground worldwide. It’s a mindset, process, toolkit for innovation that fits particularly the digital and technological transformation companies face, since it puts the user or customer central in developing solutions. In the core, it’s an approach to encourage creativity that can lead to innovation. Everybody’s talking about innovation these days. While many organizations focus on innovation and Design Thinking as a way to innovate, the most successful organizations focus on creating a culture in which innovation thrives. Innovating through hackathons, bootcamps, brainstorming sessions, sprints and the like is a good start, creating a culture of innovation is what will set you apart. This has to do with leadership. It doesn’t mean that the leaders have all the good ideas, it means the leaders create the conditions in which creativity and innovation succeeds. You cannot force sparks into workshops. 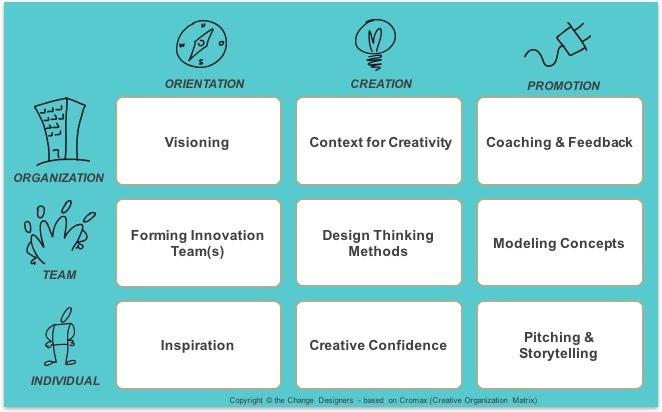 Currently, in most cases, Design Thinking is applied as a series of workshops to come to innovative ideas and concepts. This is great, but not sufficient. The best ideas usually don’t pop up in a brainstorm session or when you force people to come together and think. It’s in between, when people are drinking coffee together, walking, working quietly at their desk and many other options, that the real sparks take place. It doesn’t mean workshops are useless, they aren’t, it just doesn’t stop there, but in many cases it does stop there, because… yesterday’s and today’s workload, managing the status quo and having focus on getting fast results continues over and after the workshops. So in order to go beyond the workshops, a focus on cultural change is needed. A Design Thinking or Creative Culture seduces people to show behavior that leads to innovation. It implies understanding the creative process, knowing how to apply the tools of Design Thinking and other methods, getting inspired, creating the right environment and circumstances, knowing the different roles needed in any innovation process, but above all having a compelling vision (knowing what we do it for) and building trust. The last two are in my opinion a prerequisite for long term innovation success. 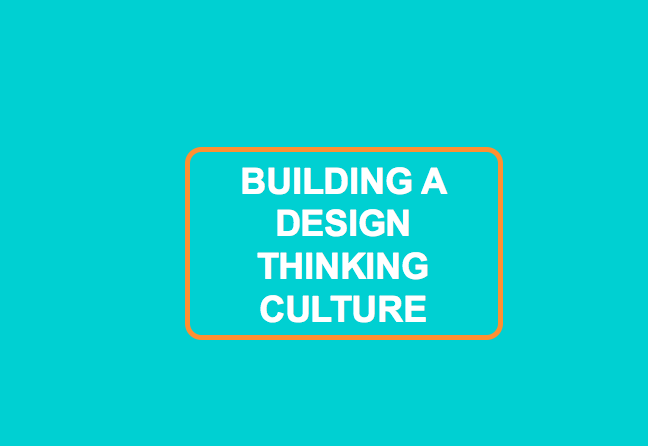 Above is a framework for discussion on Building a Design Thinking Culture. I will go deeper in each building block in my next post. In the meantime, please give your feedback and ideas on what elements you think are needed to build creative cultures.